Strategies offered to help you tackle the job. Occasionally a person needs to build or rebuild a permanent fence in the winter, and the biggest challenge is setting posts in frozen ground. If the frost is too deep to pound posts, one solution is to use a metal “post” to create a pilot hole. The pilot post will often go down through rocky ground, pushing aside the rocks, and will also penetrate frozen ground, whereas a wood post would be forced out of line or would shatter. Michael Thomas, a rancher and custom fence-builder at Baker, Idaho, uses a 7-foot (ft.)-tall metal pilot post to create holes for wood posts in difficult conditions. 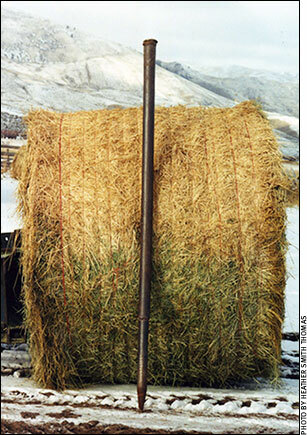 If frost is too deep to pound posts, ranchers can use a metal “pilot” post to push through hard, rocky ground to create a pilot hole for fencing posts. “The pilot post is only 3 or 4 inches in diameter and creates a hole to put the wood post into. The pointed bottom is solid drill steel about 3 feet long (to break rock or go through frost). The rest of the pilot post is hollow, like well casing. This makes it a little lighter to carry. The top has a solid cap for the post pounder to hit. You drive the pilot post as far as you can, pull it out with the tractor loader, and insert your wood post into the pilot hole and drive it in — forcing it into the slightly smaller hole — and it is very solid and secure,” explains Thomas. If you are driving wood posts with an automated driver, the pilot post is handy to start the hole, he continues. “You just need to be sure you can pull the pilot post back out.” Most of the automated drivers are already affixed to a loader or a three-point hitch with which you can pull it out. When you build a pilot post, make sure you have a way to hook a chain to it and pull it back out, he advises. Another trick Thomas uses is to create little “ovens” by cutting 50-gallon metal barrels in half. He sets each half over a small fire built over the spot the post must go. The half-barrel contains the fire and any sparks that might otherwise be risky for igniting nearby dead grass, haystacks or other flammable material. A small smoke hole is cut in the top of each oven, and an air vent hole is cut near the bottom. The fire can be safely left to burn overnight. Editor’s Note: Heather Smith Thomas is a freelancer and cattlewoman from Salmon, Idaho. Angus Beef Bulletin® | Angus Genetics Inc.